Latest How I Got Here! Elliott is a Junior Pre-Business Major from Belgium. He enjoys representing the University as a positive role model to prospective students. He chose the University of Houston for quality education and affordability. My name is Elliott Keymolen. 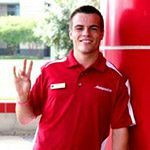 I am an international student from Belgium entering my sophomore year at the University of Houston. As from next semester, I will be double majoring in Supply Chain Management and Finance. I come from a town called Antwerp, famous for being the capital of diamond trading. Much like Houston, Antwerp is very diverse and it is actually the second most diverse city in the world with 168 different nationalities. However, this is about the only aspect that my hometown and Houston have in common. Growing up, it had always been a dream of mine to study and live in the United States. During my last year in high school, I made the decision to go to a university in the United States. In Belgium, the process is very simple. There is no complicated application required. No standardized test scores, no GPA, class rank, essay, or letters of recommendation. The only thing a high school graduate needs to do to is hand in their high school diploma and register at the university they’d like to attend. Therefore, I knew very little about the American college application process. 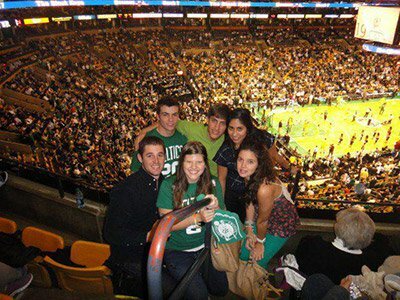 My first step was to go to Boston. I studied at an English school called Education First where I joined their University Preparation programme. They helped me get ready for the SAT and TOEFL tests and complete applications to colleges in the United States. My family, meanwhile, was still in Belgium at the time I was looking at different schools in Boston. They informed me that my father had received a job offer in Houston. And they were willing to move there if I decided to attend a university in Texas. 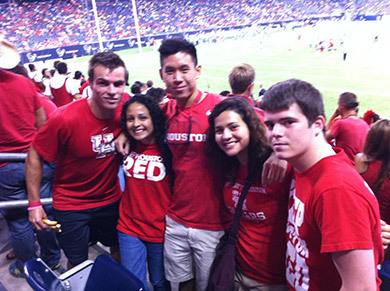 After the necessary research, I came to the conclusion that the University of Houston would be the perfect fit for me. I realized that the city of Houston would offer me plenty of opportunities after I graduate as a business major in the prestigious Bauer College of Business. In addition, the University of Houston would offer me a great education at an affordable price, relative to similar Tier 1 universities which makes Houston a great ‘value’ school. I remember my first day of classes as if it were yesterday. I had only been in Houston for a month before the semester started, and I only knew a few people because of an extra one week Summer Class I took in August. When I walked out of my dormitory I experienced my first ever culture shock. First of all, I had to deal with temperatures and humidity I had not experienced much in my life before, coming from rainy Belgium. Second, coming from a high school graduating class of 70 people (which is not a small class in Belgium) I felt very irrelevant on a campus of 40,000 students. When I entered the classroom of my first class, I was very relieved to see some of my friends I had met in the Summer Class. From that point on, I did not think about my initial feelings anymore as I met countless people throughout my first day. It made me realize that even though this school had the population of a small city, there was a strong community and we were all part of the Cougar family.